Links remain to be a ranking factor in 2019 and still going strong. No doubt that people who invest their time, money, and resources to put a link building strategy in action will do experience a greater gap in the search competition. However, one should highly consider the sustainability of the campaign. Personally, I don’t believe much with short-term thinking in link building — like a season to start and stop. Given the strength of competition in any industry where any upcoming brand can dive into the game and start dominating through a solid link acquisition campaign, it is unwise to think short-term. So, how can you sustain your link building campaign? How can you ensure that you’re producing the right types of links for your website? 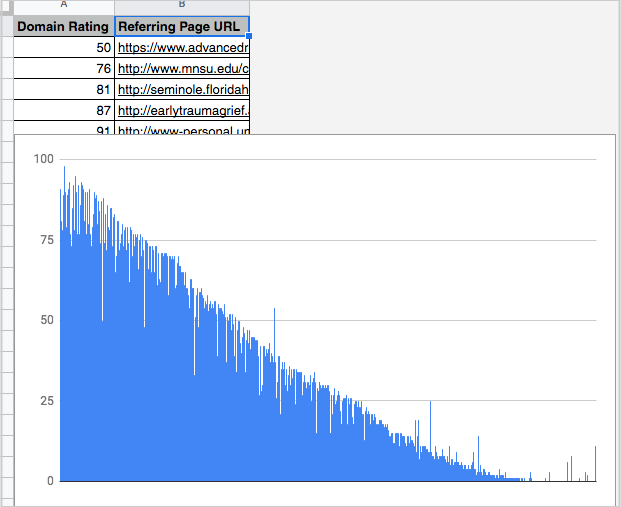 Can you guarantee consistency of production in link building? One important factor to scale and sustain your link building campaign is to understand your audience online. Not every business has available high authority links that can match to their targets. So if you’re thinking of only qualifying link prospects that are DA70 and above, you are limiting your opportunities. The way to assess a good range of metrics is to do a quick reverse engineering of your competitors, even most the top ones in your space. Check the average DAs of their linking domains, and set a good range of metrics that correspond to the market you’re in. By doing that, you now have a good benchmark of metrics that fit your audience market and not a generic standard metric range for all industries – because again, every industry’s link environment is different. When you go through your research, start asking, are there enough publications in my space that regularly produces content primarily targeting my audience? What are their average metrics (Moz’ DA, Ahrefs’ DR)? Not only finding a good range of qualifiers for your link metrics, but also searching for a list of regular linking partners. This would sustain your link acquisition process, as you are able to build links from the same referring domains. Of course, the idea of only choosing the right linking partners based on their capacity to drive readers to your blog and/or to bring potential customers to your business is a must. But more than that, you seek for a good number of linking partners (potentially 5 to 10) where your brand will regularly contribute content with contextual links pointing to your content assets. Strong relationships with industry content publishers would help you sustain a link acquisition process for your site. You can go over to starting low-authority blogs in your niche. By partnership, you’re seeking not just high-authority blogs, especially in a tightly-audience setup where you can’t seek much quantity of publications. This part that is mostly overlooked by business owners is just concerned about the investment budget (monthly) for a link building campaign. Spreading out your budget for a series of months to get a consistent number of links from an agency or your in-house link building team is good, but look into how you can also maximize existing resources you’ve produced on your blog. Are there any formats your content pieces haven’t turned into? Visual to video? Text to video? A few of the resources you do have can be maxed out to be distributed on platforms that can help your brand be more visible in your online community. One of the primary concerns of any agency and business owner in executing link building campaigns is the cost of the entire activity – from content production to outreach overhead costs. Any of these things demand a price but can unknowingly be minimized if a good in-house team or agency can evaluate their own processes. The process that is focused on results will produce more than a traditional process that strictly based on time period (i.e. two weeks link prospecting and two weeks outreach setup). Can you use a consolidated platform in outreach that will give you a more streamlined process than using several spreadsheets for different clients? Spreadsheets for organizing link targets is efficient if it’s been monitored regularly and protocols for adding inputs to the spreadsheets (link details and contact numbers) are the same for all link prospects and outreach specialists. Another thing you can add to your process is fitting content pieces to linkable audiences. 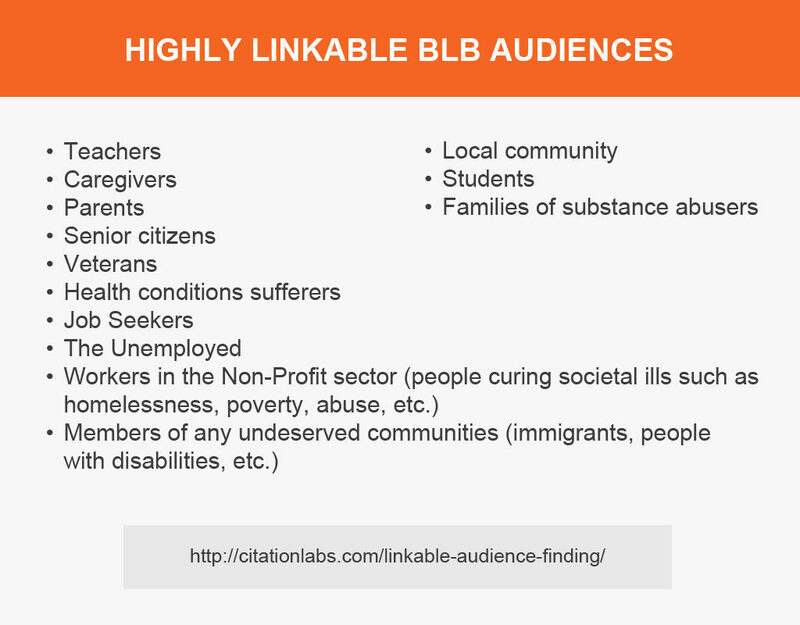 There are 601 audiences accumulated by Citation Labs. Depending on brand relevance, one can pursue as many audiences as possible as long as they are perceived as potential customers. To expect sustainability of a link building campaign, you must look at the internal considerations (your link building team’s processes, tools, resources) and external ones, such as available linkable audiences, a range of link metrics suitable in your audience market and a good grasp of potential linking partners in your space. Every industry and every business is different. You must make due diligence in research for context and timing in your niche’s link market. Your posts are always a great resource for SEO practitioners, especially in the area of link acquisition. I think the idea to start out with partnerships with low-authority blogs is very realistic. As a blogger, I experience first-hand this type of partnership for my niche sites. Thanks for sharing this. A great read, indeed!